We will once again be celebrating the very best in business with the Melton Times Business Awards. Now in its ninth year, the awards are a chance to shine the spotlight on your business, its employees and achievements. And with 12 categories to choose from, there’s an opportunity for all. We are calling on readers, customers and businesses themselves to tell us who deserves an ‘MBA’ – Melton Business Award – after their name. The prestige of winning an award is in itself a real boost and can help win custom. This year’s awards will be held at Scalford Hall on Thursday, May 26. Melton Times group editor Mark Edwards said: “This is a wonderful opportunity to share your success, to shout loud and proud about your achievements and those of your employees. ** To make a nomination, or enter, simply CLICK HERE to fill out the online form. Once the nominations and applications are received, judges will produce a shortlist and then carry out visits to determine their finalists and winners. BUSINESS OF THE YEAR, Sponsored by Duncan & Toplis - This award is open to any business and will be awarded to the company which has made the most significant impact in the last year or so. PEOPLE DEVELOPMENT, Available for sponsorship - We are looking for employers who can best demonstrate a real and continuing commitment to training. The winner of this award will be more than just a good company to work for, their culture will deliver commercial results and they will be an inspiration to other businesses. BEST EATING EXPERIENCE, Sponsored by Samworth Bros - This award is for a local hotel, restaurant, café or pub that can demonstrate creativity, good customer service and great food/dining in the Melton Mowbray readership area. The finalists in this category will be “mystery dined”. 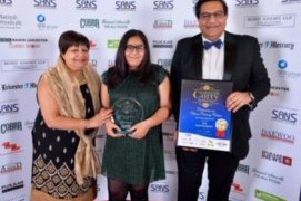 CUSTOMER CARE, Sponsored by Melton BID - This award will recognise the organisation, irrespective of size or sector, that can prove the customer really does come first. BEST SHOPFRONT, Sponsored by Viking Signs - This award will recognise those businesses which have invested in good shop front design and take pride in their appearance. GREEN ACHIEVEMENT, Sponsored by Pam Saint-Gobain - This award will is open to any businesses that can demonstrate a commitment to environmental sustainability and achievements could cover actions to reduce the company’s carbon footprint and/or the development of environmental goods or services that will contribute to reduce environmental impacts and improve sustainable development. AFTER DARK AWARD, Sponsored by Safer Melton Partnership - The award recognises those businesses that encourage people to use the town centre from early evening until late night.